The Big Idea: Encourage families to teach kids healthy routines. Have participants act out handwashing steps in a way that they can later show to kids. Make sure to include washing the fronts and backs of hands, in between fingers, and around fingernails. Kids should wash their hands for as long as it takes to sing the whole alphabet song! Review the importance of good teeth-brushing habits: going in circles, brushing the front and back of all teeth, and brushing for about two minutes at least twice a day. Remind parents to help younger kids brush. Next, talk with families about “every so often” routines, like visiting the doctor and dentist to help kids stay healthy. Point out that by doing so, parents are building a team that tracks and nurtures kids’ growth. Encourage parents to make well visits for themselves, too—they will be showing kids that that it’s important to take care of your health. 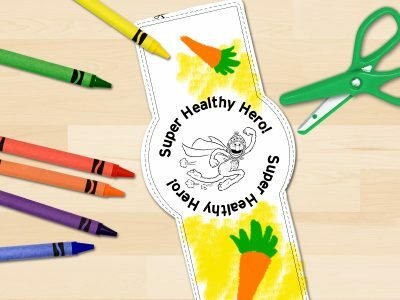 Hand out the Super Healthy Heroes bracelets and help parents brainstorm times that they might give them to kids. For example, a parent might give one after a child brushes twice a day for a week. Let parents know that their encouragement will help kids turn their healthy actions into habits.